that I was able to review, just as I was starting to pull my hair out... again. I may be graduating my third son this week, but I still have 4 more to go, and I truly needed to take a look at our homeschool as we approach this next season. 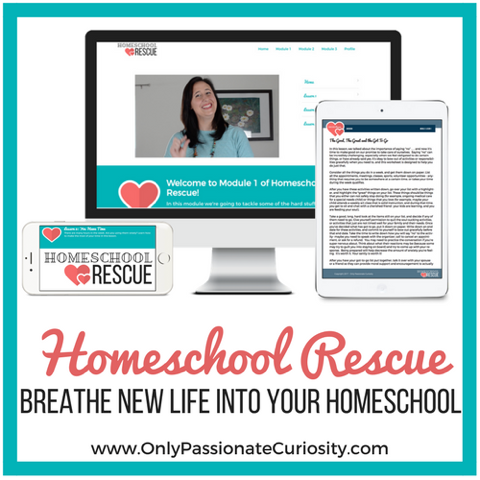 Homeschool Rescue is a 60 day ecourse, but don't let the time mention scare you away. You have unlimited access for life and can take this course at your own pace. Heather even graciously sent out an email reminding us of this, that you are not behind! Already feeling overwhelmed with school, you don't need to feel overwhelmed with getting help. This is at your own pace, but you should be able to get through a lesson each week. There are 20 lessons total, divided up into 5 modules. 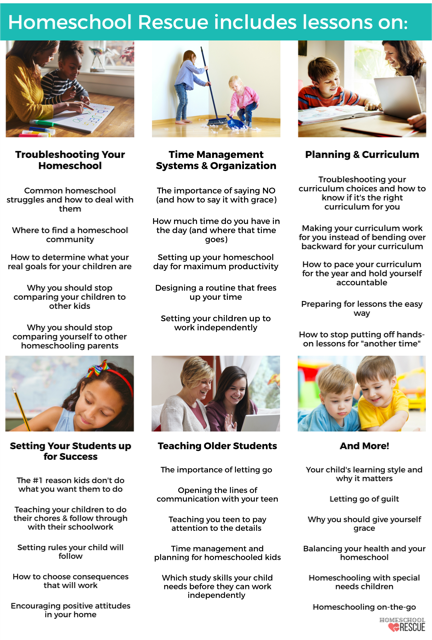 The course first takes a look at your homeschool and trouble shoot what may need tweaking. Each lesson provides a printable worksheet to evaluate your school with. Each worksheet helps you put into practice what you just heard through the video. It helped me set aside my actual goals for our school. Having that in hand written, gave me the freedom to plan according to each child, rather than compare to other homeschoolers or even the public schools and what they are doing. Often times, their goals are not the same as mine. Heather takes a hard truth revealing look at ourselves as well. Shut off those phones, set aside the distractions that make the teacher unavailable like they should be. That part really spoke truth into my day. For me the time management portion was very helpful. With home educating 5 children at once, I do tend to get overwhelmed and there are always kids who fly under the radar. Simple things like not scheduling appointments during the morning of a school day because you know full well you won't get to it in the afternoon. Don't let people take advantage of your time, thinking you have more because you are homeschooling. It is ok to say No to things. Module 3 addresses curriculum and organizing your school supplies and space. That is a must for me! Again a module that really addresses the heart of the school. With having many children, they each have a different learning style that I need to take in account when choosing curriculum. Heather does have a bonus lesson in module 1 that address learning styles. Module 4 looks at self esteem, how to encourage kids to get their work done, incentives and consequences. It also takes a look at following through, which is something I falter in. I just get 'tired' and it is easier to quit. The encouragement in this ecourse is the best I have found! The last module tackles those teens. Getting them to work independently and learn time management skills. I have one going into high school this year, and though I have three already done, I do feel like we can be refreshed in starting with my 4th son because of going through this course. In addition to the course there is the opportunity to be a part of a facebook group with other moms going through the same program. Encouragement and like mindedness multiplied as you work your way through the lessons and homework. Advice, encouragement, and maybe even friendships. This type of course should be utilized by homeschool groups. I have not in my 14 years of educating, seen anything like this for helping the homeschool parents to evaluate their school, and grow in ways they should be. I have not gotten through the entire course, I have had to give myself grace as we gear up for a graduation and party to follow. But I do know I will be finishing the entire course before we start back up with school this summer. I want to be the very best teacher I can for these 4 students left at home, and Heather has been such a blessing in motivating me to do that. 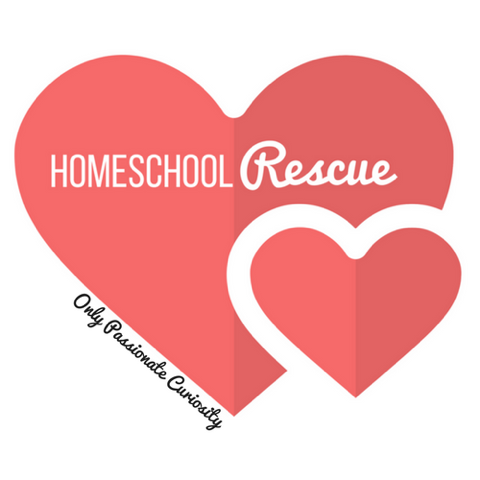 Click on the banner below to see what others on the team thought of Homeschool Rescue!